Our expectation for the Spring season is to have approximately 1600 players total playing in 2 separate leagues - ORWALL American and ORWALL National. Both leagues are chartered separately, but run under one Board of Directors. Little League Baseball encourages boys and girls to become part of the Little League experience. The League is comprised entirely of volunteers that freely give their time to help our ORWALL youth learn the game of baseball and embrace the Little League Baseball motto: Loyalty, Character and Courage. Thanks in advance to all of the volunteers that will help this Spring be a successful endeavor for everyone! Are Credit and Debit cards accepted at In-Person Registration Sessions? Yes. We accept Visa, Discover and Mastercard for all registrations. Cash and checks are welcome at In Person registration as well. ORWALL is a 100 % non-profit volunteer organization. Our budget addresses equipment, uniforms, field improvements, field maintenance, utilities, insurance, and administrative expenses. In addition, ORWALL is committed to providing umpires for all games from age 7 and up. The registration fees are reviewed each year by the league Board of Directors and modified as expenses go up. Do ORWALL Directors get paid? No. Unlike some other Youth Sports Organizations, the Board of Directors for ORWALL is 100% volunteer. No Director receives any financial compensation for their services to the League. In addition to registration fees, ORWALL actively pursues donations from Corporations, local businesses and private sources. As an active non-profit organization, ORWALL also requires all our Spring teams to seek and obtain a team sponsor. The ORWALL Board of Directors actively sponsors Opening Day fundraising activities (silent auction, arts & crafts sales, t-shirt sales, etc.). In the Spring, ORWALL charges a mandatory "fundraising fee" for each child. The fundraiser varies from season to season. In previous years, this fee entered your family in a raffle drawing for a new car donated by a local dealership. ORWALL is chartered by Little League Baseball and must follow their rules, regulations and guidelines. There are 7 divisions based on age (as of April 30th of the playing year) which are: K-Ball - age 4 & 5; T-Ball - age 6; Machine Pitch – age 7 and 8; Kid Pitch - age 9 and 10; Little League Minors age -11; Little League Majors age - 11, 12; Juniors League - age 13, 14; Seniors League - age 15, 16; Big League - up to age 18. Each Division has an assigned Player Agent (Division Director). ORWALL is part of the Little League International, which is broken down by regions (5 in the U.S. & 4 international), sections (several within the state of Texas), and districts. 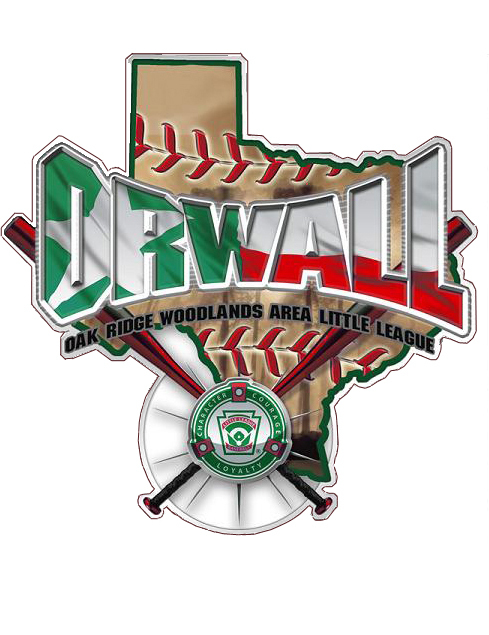 ORWALL is part of the Little League Southwest Region, Texas East State, Section 2, District 28. ORWALL is comprised of 2 separate charters - American and National - that are run under one board of directors. If I have issue with my child's manager? Speak with the manager about your concerns. 99% of the time this will take care of the issue. If you still are not satisfied, your next contact would be the Player Agent (Division Director) for your division. If you feel the issue is critical, you are always free to contact the VP of Operations or the President directly. Can I become a ORWALL Board member? Each year in April, the Board of Directors must be re-elected. Any adult resident living in the ORWALL boundaries can apply to become a board member. In April, email orwallbaseball@yahoo.com if you would like to put your name on the board of directors ballot. All applicants must undergo and pass a background check. What are the Boundaries of ORWALL? The Boundary Map is located in the League Documents Section of the Website. When Do I register my Child for ORWALL Baseball? In Person registration is held two times a year prior to the Fall and Spring Seasons. Generally, Fall registration is early to mid-August and Spring registration is December-January. Registration Dates are placed on the ORWALL Calendar. Online Registration is available through the ORWALL website for returning players. Following the Second "In Person" Registration, Registration may close so Register Early. What Documentation do I need for Registration? All Players are required to submit a Birth Certificate for Age Verification and Proof of Residency. Proof of residency requirements can be found in the League Documents. What age group can my child play? A Player's "League Age" is determined by thier age on or before April 30th of that year's Spring Season. Fall "League Age" is determined by the "League Age" in the Following Spring Season. League Age Charts are also posted in the League Documents Section of the ORWALL web site. Players are not Permitted to play in any age group lower than their "League Age". "Playing Up" or playing in an age group higher than thier league age is not permitted in the Fall. In certain cases in the Spring season, a Player may be permitted to "Play Up" provided they are drafted to a AAA team prior to the 6th round of the draft. The Player must try out in both their age group and the group they wish to "Play Up" to. In order to do this, the Division Director must be consulted. Majors Vs. Minors (which one should my 12 Year Old Play? Refunds can only be requested prior to the first day of player drafts. For more information please consult the League Refund Policy in League Documents. How are Managers / Coaches Selected? Managers / Coaches are selected immediately following the last "In Person Registration" night at ORWALL. Managers / Coaches are required to fill out an ORWALL application as well as a Volunteer Background Check form prior to the selection process. The Elected Board of Directors of ORWALL votes on and appoints coaches based on previous experience in both ORWALL and other Volunteer Organizations, Parent Reviews if they have previously coached at ORWALL and experiences/records in prior seasons. Are there Tryouts for the Teams and What is Involved? Tryouts are held in the week following the last "In Person" Registration @ ORWALL. Tryout format will include (4) Stations... Ground Balls, Catching a throw from a player, pop flies and batting. All Players will be given (3) opportunities at each position to display thier talent level for the Managers/Coaches. All players are required to tryout in order to qualify for the AAA or Majors draft. There are no try-outs for Kball or Tball (League ages 4-6). Kball and Tball teams are formed based on neighborhood. Due to the extremely large number of kids playing Kball and Tball, ORWALL does not honor "friend requests" for team placement. The draft for each division will be held on separate days. All managers will draw numbers to determine their position in the draft. The only "player freezes" are the Managers son(s) and are determined by the Little League "Green Book". In the event there is a player who is registered but cannot attend one of the designated try-outs, that player will then be eligible ONLY for a AA team. The player will be assigned to a AA team via a "hat pick" after all players who have tried out have been selected. Trades between teams will be allowed immediately after the draft, during a specified time period, with both Coaches' agreement and the approval of the Division Director. ORWALL is a 100% Volunteer Organization. As an organization we do our best to recruit the best that the area has to offer in volunteer coaches. In some instances, we do end up with teams without volunteer coaches. When this does occur, ORWALL does not want to take away the chance for players to get in the game. Instead, the Division Director will schedule a meeting with the team and either has one of the parents step up and offer to coach the team or find a way for the Parents to assume the duties of coaching the team. In most cases, 2-3 parents on the team take the opportunity and the results have been very positive. If you have other questions you feel should be answered on this page, please email them to orwallbaseball@yahoo.com and put "FAQ" in the Subject Line.